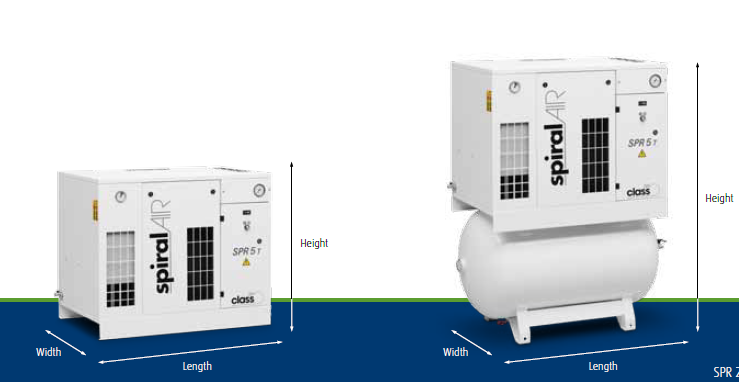 SPR 2-8 oil-free scroll compressors provide high-quality compressed air for critical applications in a wide range of industries. Continuous investment in research and product development has resulted in both economical and ecological compressors. The range is built focusing on three pillars to make them stand out. Ultimate 100% oil-free, clean air. The integrated air dryer enhances the air quality and protects your air network against corrosion. No filtration system required to remove residual oil along the network. Unloaded power comsumption is eliminated thanks to the simple start/stop control. Standard equipped with IE3 motor. The use of high quality materials and a scroll design with a minimal number of moving parts, ensures a long operating life with a minimum number of service interventions. No need for oil change and no requirement for oil waste management. Service friendly vertical lay out.